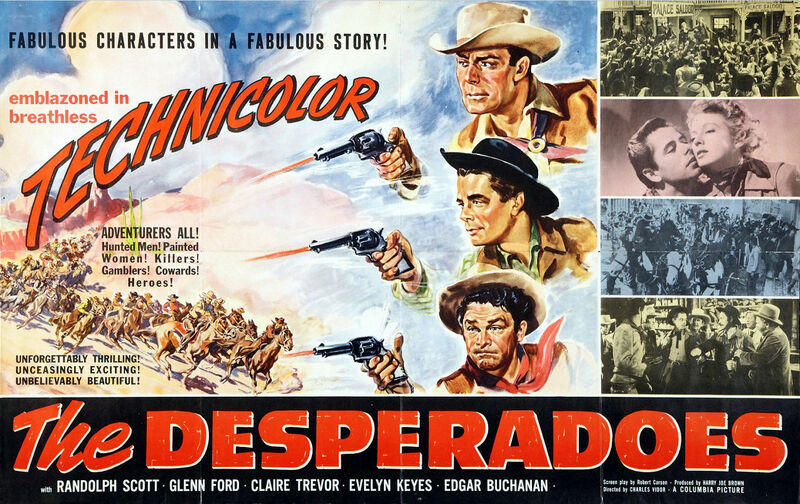 There’s a lot to like about THE DESPERADOES. Not that it’s anything groundbreaking; it’s your standard Western outing with all the standard clichés. you’ve got your two pals, one the sheriff (Randolph Scott ), the other an outlaw (Glenn Ford ). You’ve got your gambling hall dame (Claire Trevor ) and sweet young thing (Evelyn Keyes) vying for the good/bad guy’s attention. You’ve got your goofy comical sidekick (Guinn ‘Big Boy’ Williams). You’ve got your supposedly respectable heavy (Porter Hall ), a mean heavy (Bernard Nedell), and a heavy who has a change of heart (Edgar Buchanan). What makes this one different is the movie seems to know it’s clichéd, giving a nod and a wink to its audience as it merrily makes its way down that familiar dusty trail. This entry was posted in Film, Film Review and tagged Charles Vidor, Claire Trevor, Columbia Pictures, Cracked Rear Viewer, Edgar Buchanan, Evelyn Keyes, Gary Loggins, Glenn Ford, Guinn Williams, Porter Hall, Randolph Scott, Raymond Walburn, The Desperadoes, Through the Shattered Lens, western. Bookmark the permalink.